Pinnacle Restoration, Bromley, Kent, UK. Specialising in the restoration and cleaning of Stone Masonry. Stone Mason. Welcome to the Website of Pinnacle Restoration, Bromley, Kent. Philip Skeffington is a Stone Masonry, cleaning and restoration specialist. Philip served an apprenticeship with a well-known firm of Stonemasons in Kent and has been in the trade for more than 21 years. His firm, Pinnacle Restoration, supplies and install reconstructed Stone Balusters, Coping Stones, Porticos, Cills, Urns, Cornice and Architrave. 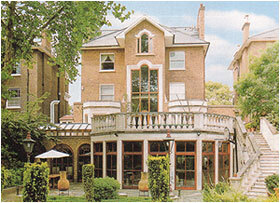 Exterior architectural mouldings are reformed to the original design. Brick and patio chemical cleaning is another part of Pinnacle's specialist services. Stonework is restored to its original beauty. 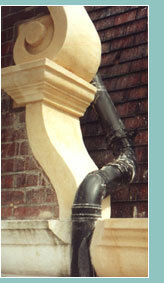 All our repairs to Masonry, Stucco Work, Ashlar, Cornice, Run Moulds and Mortars are carried out in sand and cement. Philip, as a member of the Guild of Master Craftsmen, can carry out specialist restoration, conservation work, historic stonework and brickwork to an extremely high standard. Some years ago he worked as part of a team restoring and cleaning Nelson's Column, The Houses of Parliament and other historic buildings and monuments in London. Pinnacle Restoration provides a personal service. We can provide specialist advice and free estimates for you. If you would like any more information about the company, or have any enquiries then please don't hesitate to contact us either on the details above, or by filling out the enquiry form.